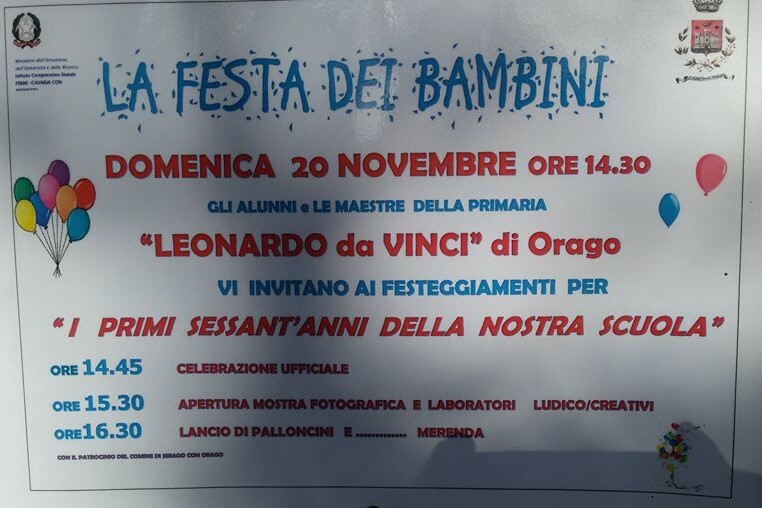 LA FESTA DEI BAMBINI - "I PRIMI SESSANT'ANNI DELLA NOSTRA SCUOLA"
I FESTEGGIAMENTI PER I PRIMI SESSANT'ANNI DELLA SCUOLA " LEONARDO da VINCI " DI ORAGO SI APRIRANNO ALLE ORE 14,45 CON LA CELEBRAZIONE UFFICIALE CON LA MUSICA DELLA BANDA DEL PAESE IL CORPO MUSICALE SANTA CECILIA DIRETTO DAL MAESTRO SILVANO SCALTRITTI. FESTA APERTA A TUTTI SIA PER VIVERE UN POMERIGGIO DI DIVERTIMENTO CHE PER CONOSCERE LA SCUOLA, L' INVITO E' RIVOLTO SOPRATTUTTO A TUTTE LE FAMIGLIE DEI PAESI LIMITROFI CHE CERCANO UNA SCUOLA PER I PROPRI FIGLI, SARA' L'OCCASIONE PER CONOSCERE L'ISTITUTO CHE PREVEDE VARI SERVIZI: IL PRE SCUOLA, IL POST SCUOLA, USCITA ALLE 16, LA MENSA, LA PALESTRA, SALA DI INFORMATICA, PROGETTI LINGUISTICI, INIZIATIVE EDUCATIVE, LUDICHE E RICREATIVE DURANTE L'ANNO. INTERVERRANNO: IL DIRIGENTE SCOLASTICO DOTT.GIORGIO CANTONI(NATIVO DI ORAGO HA FRAQUENTATO QUI LE SCUOLE ELEMENTARI),IL SINDACO DOTT.GIORGIO GINELLI,IL VICE-SINDACO GIUSEPPE LUIGI LODI PASINI, L'ASSESSORE ALL'ISTRUZIONE ANNA CARNINI. INVITATI MOLTO SPECIALI LE MAESTRE CHE HANNO INSEGNATO DAGLI ANNI CINQUANTA ED IN PARTICOLARE LA SIG.RA ADELE PARACHINI( MAESTRA DELL'ATTUALE DIRIGENTE SOLASTICO). CURIOSITA': TRA I TANTI EX ALLIEVI CHE HANNO FREQUENTATO LA SCUOLA DA SEGNALARE ALESSANDRO COSTACURTA EX CALCIATORE DEL GRANDE MILAN DEGLI ANNI 90. UN RICORDO VA ALLA MEMORIA DELLA MAESTRA SIG.RA GIULIA MAGNONI LODI PASINI CHE HA DEDICATO LA SUA VITA ALL'INSEGNAMENTO. ALLE ORE 15.30 SARA' APERTA AL PUBBLICO UNA NUTRITA MOSTRA FOTOGRAFICA CON ANCHE OGGETTI SCOLASTICI CHE CI RIPOTERANNO INDIETRO NEL TEMPO. I BAMBINI DELLA SCUOLA MATERNA - ORAGO ARRIVERANNO ACCOMPAGNATI DELLE INSEGNANTI E PARTECIPERANNO AI LABORATORI LUDICI DI CUCINA,CREATIVITA' CON LA CARTA E GIOCO SPORT APERTI A TUTTI. 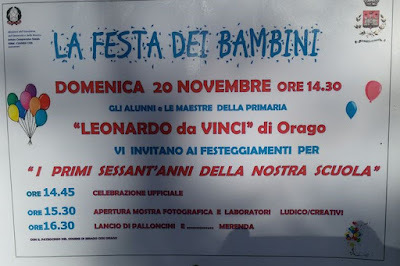 VERSO LE 16.30 TUTTI I PICCOLI PARTECIPANTI LANCERANNO I LORO DISEGNI E I LORO PENSIERI DEDICATI ALLA GIORNATA INTERNAZIONALE DEI DIRITTI DELL'INFANZIA APPESI A COLORATISSIMI PALLONCINI E PER FINIRE CIOCCOLATA E DOLCI TER TUTTI. New Diet Taps into Revolutionary Idea to Help Dieters LOSE 12-23 Pounds in Just 21 Days!